Rest up on Saturday, because there’s a lot going on this Sunday! Whether you’re into slow urban cruising around the streets of Reno and Sparks, or mountain biking the High Sierra, you’ll find plenty to do this weekend. Reno’s famous cruiser ride is back again, the Gonads-n-Strife Fall Poker Run. 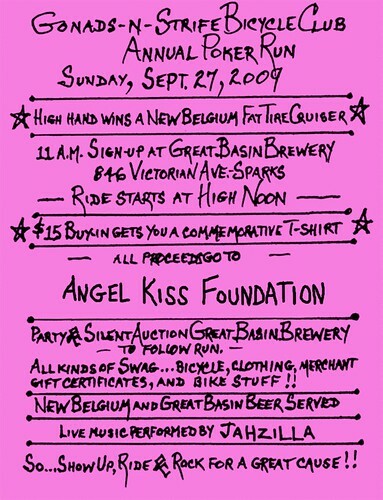 From the Gonads-n-Strife website, “Don’t be fooled by knockoffs, this is the original gonads-n-strife bike club bicycle poker run you’ve come to know and love, with high hand winning the one and only New Belgium Fat Tire Cruiser! This Fall we promise even more great raffle prizes and as usual a fantastic fun filled day of cycling! See you there!” More on the G&S website HERE. Galena Fest 2009 – And now for the mountain biking. On September 27, 2009 Reno community members will be gathering at Galena Creek Regional Park for the outdoor fundraiser, Galena Fest. Galena Fest focuses on two major mountain bike races, The Bloody Rose – nearly 12 miles and 4,000 feet and The Thorn – an easier 5 mile ride. There are also several other family friendly events including mountain bike races for kids, a sand castle contest, beer provided by Buckbean Brewery and a barbecue. On a lighter note, some of us will be riding Keystone Canyon area on Sunday morning.Meet at the radio towers at 9a.m.ish. I’m taking apart a few bikes this weekend, but the Galena Fest sounds like it will be more fun! Might have to change my plans…. Bustigator – I was talking to Mike H about riding up there, and we’d like to get the Carson crew up there to check out the trails. I haven’t ridden Keystone since the early 90’s! Let’s start planning something. I think a TBS/BikeCarson ride is in order very soon followed by a BBQ and barley pops!Lets do it very soon! This poker run is NOT a slow cruise. It’s more like a “poker race”. It’s still fun and family friendly. The time on the bike is not an overly fast pace, but don’t expect to relax and have a bite to eat or more than one beer at any of the stops. Fuel up before and eat at the end. Yeah, if you think about it, the poker run cruisers will probably be going faster than those folks climbing up the Bloody Rose 4,000 foot climb! i won 2 cases of beer! I’m the president of the gonads-n-strife bicycle club, and you have 4 hours to travel a simple 10 miles! There is plenty of time to eat and drink on my cruise, and besides, it’s for charity and nothing but positive! Thank you all so very much for coming out, and of course we’ll see you the last sunday in May, for the spring ride! HI tASHA, GOOD TO SEE YOU AND jASON!